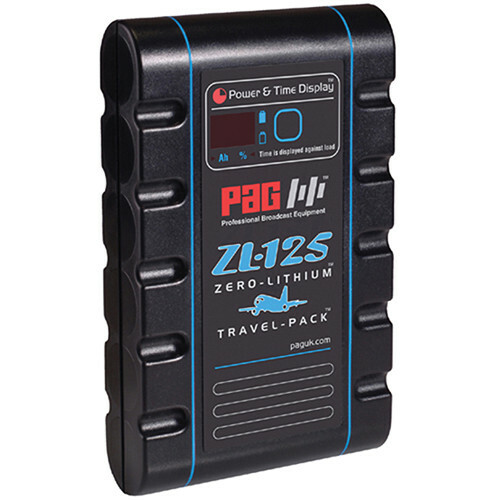 The PAG ZL-125 Time Battery 13.2V 125Wh (PAGlok) is a Zero-Lithium, compact slimline SuperPack format battery that supplies 13.2V DC power to your camera. Featuring a high storage capacity of 125 Wh, the battery supplies uninterrupted current of 8 A simultaneously to your camera and on-board equipment for a jitter free operation. It offers a quick recharging time and can be used with any PAG charger designed to charge Ni-MH batteries. Incorporating a highly accurate power and time display, the ZL-125 Time Battery (PAGlok) provides an error-free estimation of the run-time taking into account the load on the battery with a count down with 1 minute increments. In addition, it also displays capacity in ampere and percentage. In the event of excessive currents, the battery performs a self-reset, thereby protecting itself against short circuits. A self-resetting thermal trip rated at 160° F (71° C) offers thermal protection as well. Box Dimensions (LxWxH) 12.0 x 10.0 x 6.0"